It is almost the weekend! Are you looking forwad to it? You should be. The new year brings a new series of Gallery Hops! 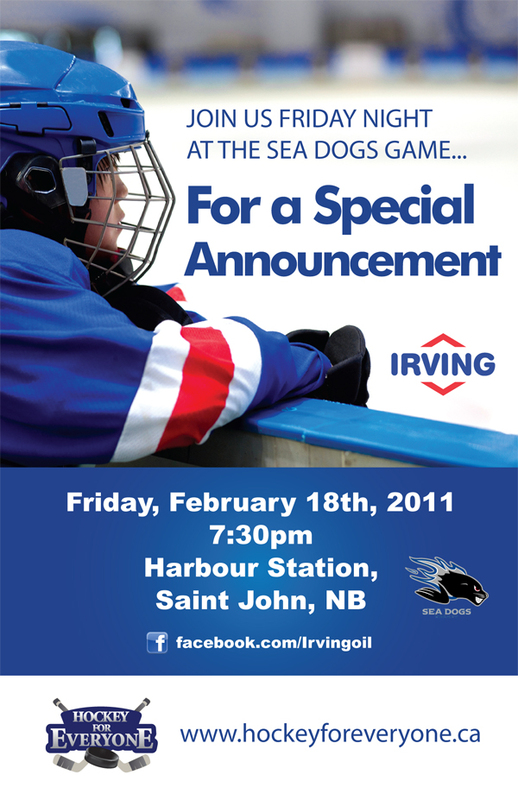 The first of 2011 is this Friday, February 25th, starting at 5pm. 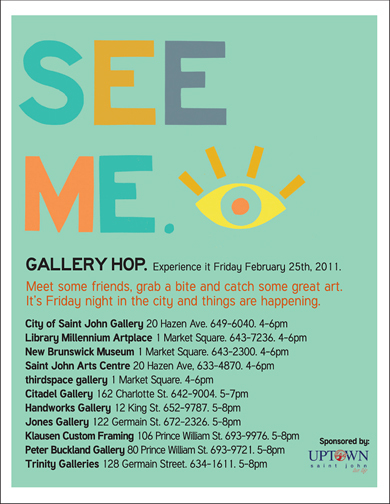 For those of you who are unfamiliar with the Saint John Gallery Hop, it is exactly like it sounds. Uptown galleries are open (most with new exhibits being launched), they serve wine and snacks and the public hop from one to the next. Below is a list of participating galleries, but before that, here are some highlights that you can look forward to as you jump from place to place! 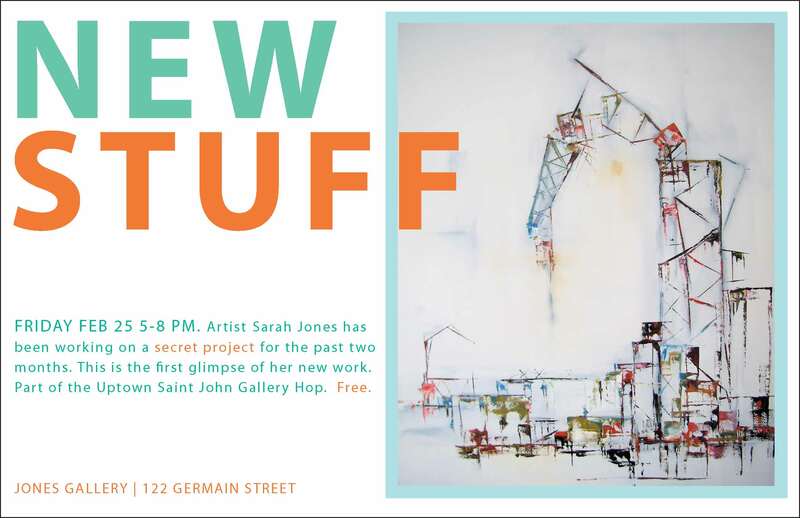 Sarah Jones of Jones Gallery – 122 Germain St. – will be revealing a new body of work (I am looking forward to this immensely) from 5-8pm. Once a discarded can, now the scales on the back of a sculpted tin fish. Once a piece of paper, now the wing of a painted bird set aloft on a wooden canvas. Once a mound of clay, now a shimmering deity come alive with the touch of fire and shape of hand. This Sunday (tomorrow, February 20th) marks another edition of the “Out with the Old, In with the New” clothing sale at Rhoda’s Flea Market, organized by none other than Kiera Fraser of Je Suis Prest Boutique. This sale is organized about 3 times a year and is an opportunity for Saint John’s most fashionable ladies to clean out their closets and turn over their wardrobes for another season. Fabulously stylish females, including Barb C. (www.barbbarbbarb.com), Nadine Brown (Envy), Kiera Fraser (Je Suis Prest) & many others from stores around town, will be selling their own clothes, shoes and accessories at rediculously low prices! I will also be there, although not nearly as stylish, and will be selling my goods, including some of the jewellery I have been making these days. Definitely an opportunity not to be missed. Lily’s Café heats things up with toe-tappin’ live local entertainment. A hearty breakfast to warm us up for a day of winter activity – served by our regional mayors: Ivan Court, Grace Losier, Bill Bishop and Murray Driscoll. Get active to the tunes of Dave Duffy all afternoon. Ski and snowshoe rentals available at Daytripping. Is your dalmatian decked out for the cold? Does your tabby tote a tutu? Register your pet at the SPCA booth and when DJ Dave calls him to the stage, have him flaunt his finest fashion for a chance to win a $100 pet store gift certificate. Pavilion Lower Deck | $5 pet registration fee | All proceeds benefit the SPCA Animal Rescue | Pre-register my pet now! Registration includes a Running Room tote bag and hat and brunch ticket. Proceeds from this race benefit the Heart and Stroke Foundation of New Brunswick. Register now! Skate to the tunes of Dave Duffy all afternoon. Ski and snowshoe rentals also available at Daytripping. 1 pm – 3 pm FREE Snowshoe and cross country ski rentals at Daytripping! Magnolia Cafe’s Literary Dinner: Pride & Prejudice (Sun 20, Magnolia Cafe, 6-9pm – $40) Limited seating, RESERVE! FUSION‘s monthly shin-dig is happening a bit early this month. Usually found on the 4th Friday, this time around the event is set for Friday, February 18th. 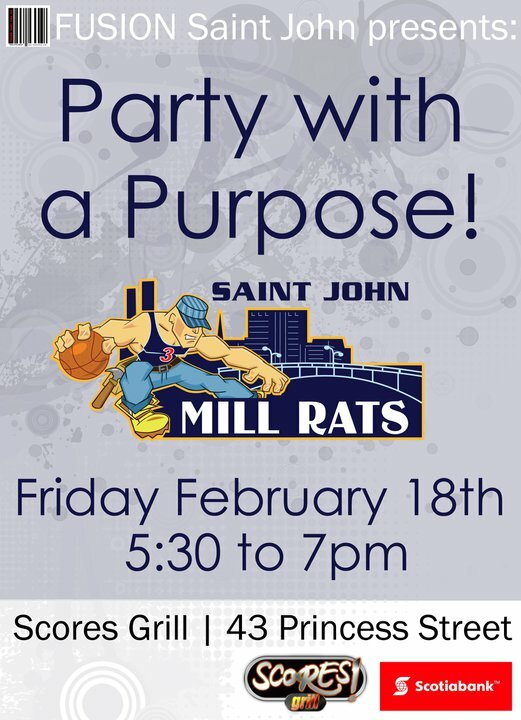 It is a new venue for FUSION, Scores on Princess St., which is fitting for the purpose of the month: The Saint John Mill Rats! For all you sports fans and/or proud Saint Johners who are curious to meet these new “hometown” athletes, the event will be a low-key mixer that gets you up close to the towering basketball players. So join me, and others, in welcoming the guys on Friday from 5:30-7pm at Scores!